Guns N’ Roses are streaming a video recap of their fall 2017 North American tour. The 25-date run opened in Philadelphia, PA on October 8 and included multiple shows in Los Angeles, New York and Toronto before wrapping up with a marathon, almost 4-hour concert at The Forum in L.A. on November 29. The band’s Not In This Lifetime reunion run is now among the top five biggest-selling concert tours in music history, according to Billboard. The trio of Axl Rose, Slash and Duff McKagan topped the $475 million mark in gross sales at the end of 2017 to place fourth on the all-time tour list, moving ahead of the fifth-place Roger Waters at $459 million but behind the top three: U2’s 360° stadium tour (2009-2011) sits at No. 1 with $736 million, followed by The Rolling Stones’ A Bigger Bang trek at $558 million (2005-2007), and Coldplay’s 2016-2017 shows at $523 million. 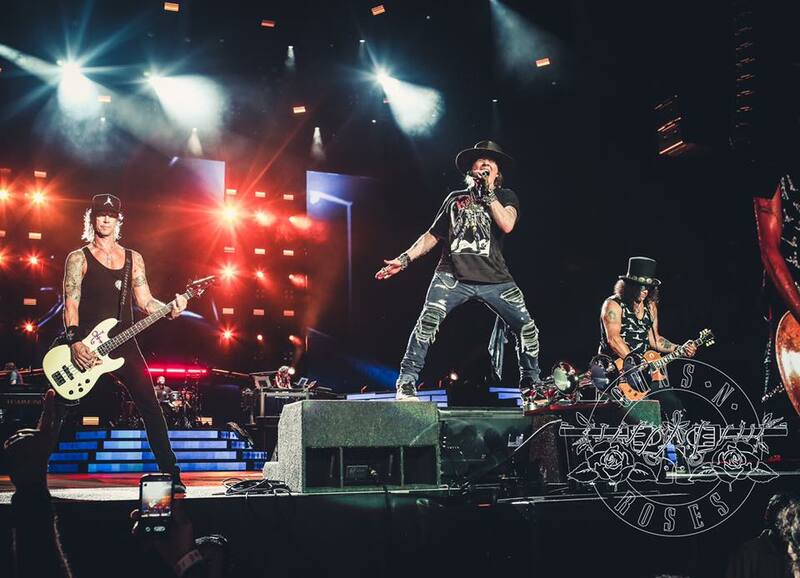 Launched in the spring of 2016, Guns N’ Roses have extended the reunion tour into a third year with the addition of summer 2018 concert dates across Europe.